Sicily is the sunny island located at the southern part of Italy. 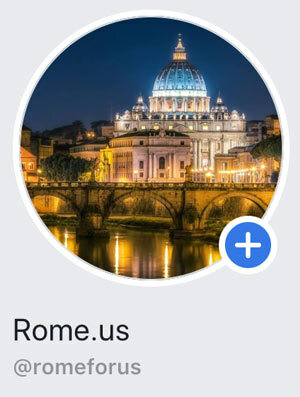 Getting there from Rome isn’t difficult and the most convenient option is by air. Moreover, you can get there by a train on a ferry or usual ferry. The distance between Rome and Sicily is 494 km. This air travel distance is equal to 307 miles. It will take from 1 to 14 hours to get from Rome to Sicily. 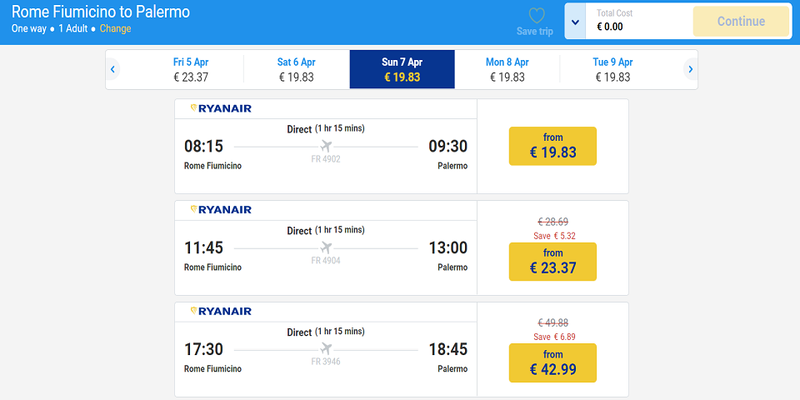 One of the most popular options is to travel from Rome to Sicily by plane with Ryanair from Fiumicino airport to the airport of Trapani and then taking a train to Palermo. 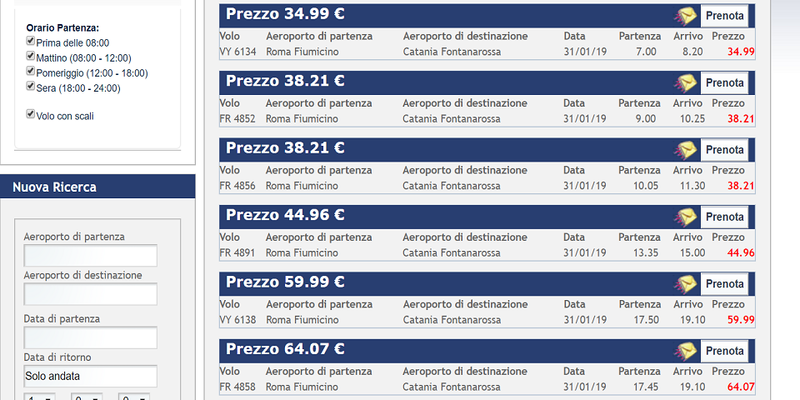 Price for one way ticket starts from 19 euro and it takes 1 hour 15 minutes to reach Palermo from Rome by plane. It is always better to book tickets in advance for cheaper prices. “Partenza” means departure, “arrivo” means arrival and “prezzo” is a price. You can also take a train on a ferry from Rome to Messina. The journey will take about 8 to 10 hours. The train on a ferry ticket costs about 40 euro one-way. There are also many Italy rail links from Rome to Palermo via Messina with many other train options going between Messina and Palermo. Travel time is about 3.5 hours and the price is 11 euro one-way. To make reservation online go to Trenitalia website. Another option is to take a train from Rome to Naples or Salerno and then take a ferry to Messina. 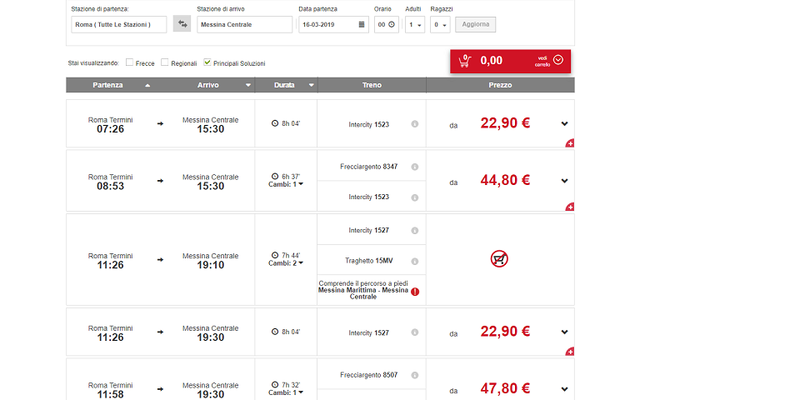 A train link from Naples takes 5.5 hours with an average price of 35 euro. You can buy a ticket to get to Sicily by ferry. 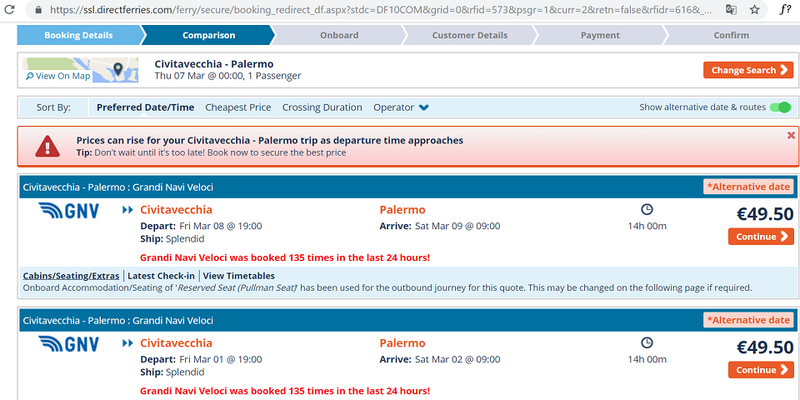 Also, you can get from Rome Civitavecchia port to Palermo in 14 hours with prices from 40 euro per adult. Yes, it is possible to get to Sicily from Rome by car. The route originates from the highway through Calabria and, crosses the Stretto, on one of the ferries. You have to buy your ticket at the port and get in line with all other cars to get on board of the ferry. The second natural attraction of Sicily is the cave, bearing the name “Ear of Dionysius” (Orecchio di Dionisio). The cave is located near the city of Syracuse. An important attraction of the island is the city of Palermo – the capital of Sicily and the main city of the province of the same name. The number of its attractions is such that it could well be enough for a small European state. 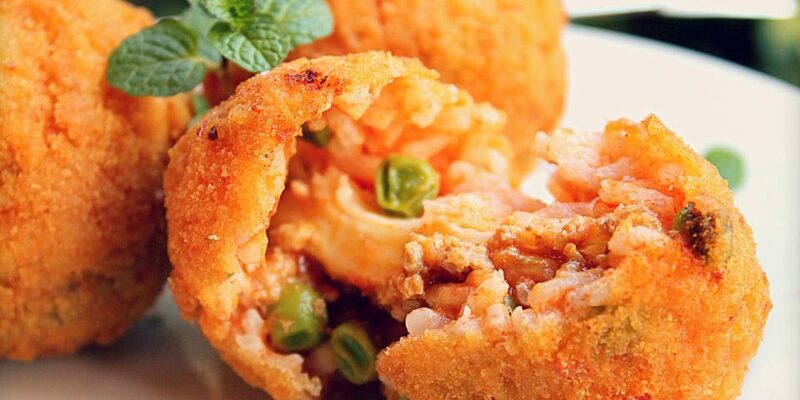 Arancini is a ball of creamy risotto rice that’s breaded and deep-fried. This is the iconic Sicilian dish! This is a perfect snack while walking around the island’s streets. 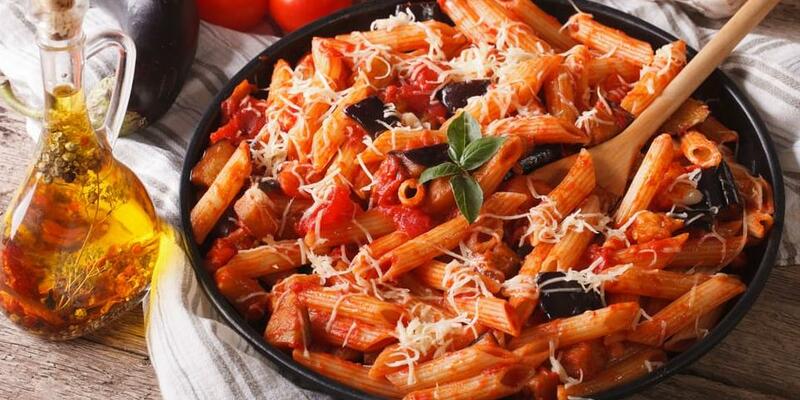 Pasta alla Norma is probably the best representation of Sicilian cuisine. It is made of local tomatoes, aubergines, garlic, basil, and salted ricotta. Must try! Perfect for vegetarians. Pasta con le Sarde is the fishy version of Pasta alla Norma. It contains fresh sardines, salted anchovy fillets and wild fennel mixed in a sauce with an addition of pine nuts, raisins and saffron. The taste is amazing. Caponata is an example of external influences over Sicily’s cuisine. The recipe can chage from one chef to another, but it must always contain aubergines, pine nuts, raisins and plenty of vinegar. It is usually served as an antipasto (starter). When in Sicily, you should definitely try: cassata, cannoli and granita. 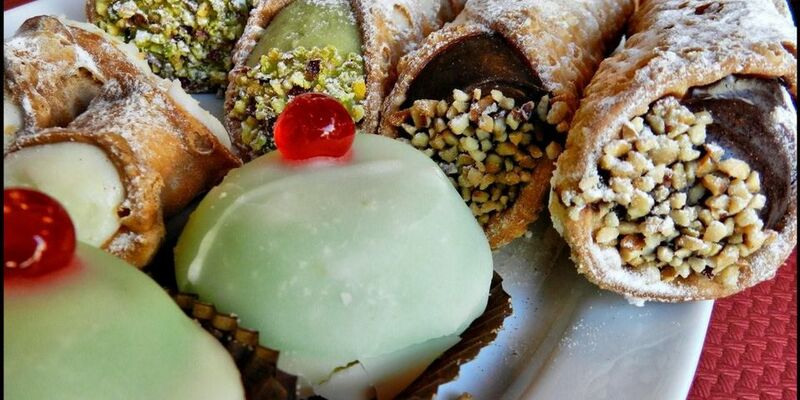 Sicilian sweets are amazing and incomparable! For instance, cannoli are little deep-fried pastry tubes piped full of creamy ricotta. Cassata is a Sicilian sponge cake flavored with chocolate, citrus fruits, marzipan and ricotta cream. Then, granita is an ice with flavors. Typical flavors are almond, coffee and watermelon. You have to eat it with a spoon, so it is not slush. 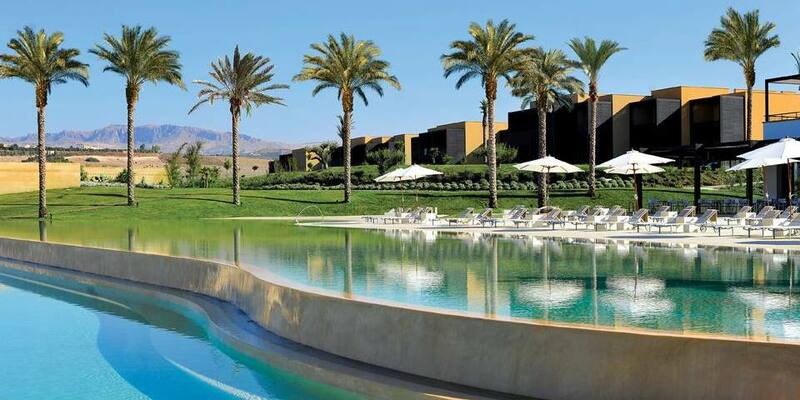 Verdura Resort is a high-rated luxury hotel located in Ribera. The resort is on 230 hectares of olive groves and Sicilian countryside. It offers a private beach, 3 golf courses and amazing sea views. 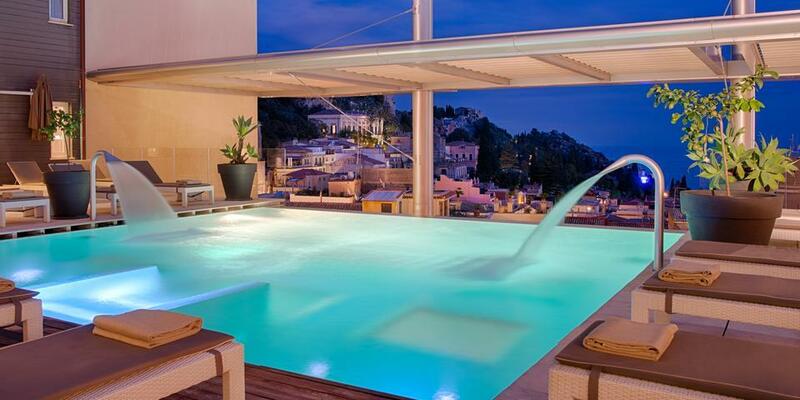 NH Collection Taormina features a roof-top terrace with a cocktail bar and panoramic views. It is set in the heart of Taormina. There are spacious rooms, a modern wellness center, and an infinity pool overlooking the bay. 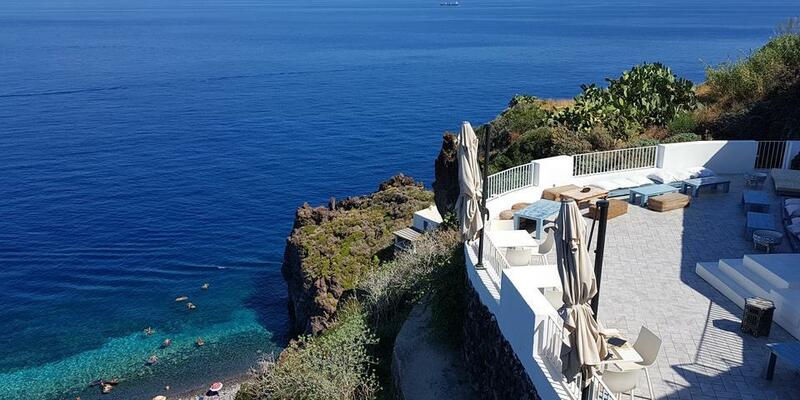 Hotel Santa Isabel is on the high rocky coast of Malfa on Salina Island. The town center is only in a 10-minute walk away. The hotel offers modern, spacious suites with a private bathroom and free toiletries. Elysium B&B is in Messina, few steps from Sant Elia Church. There is a buffet breakfast served daily. Moreover, all rooms are spacious and feature air conditioning and a flat-screen TV. 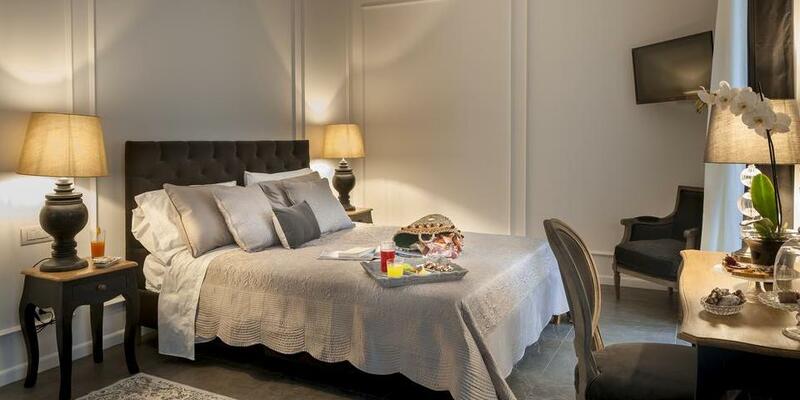 Exclusive Rooms Palazzo Natoli located in Palermo. It offers rooms with free WiFi. 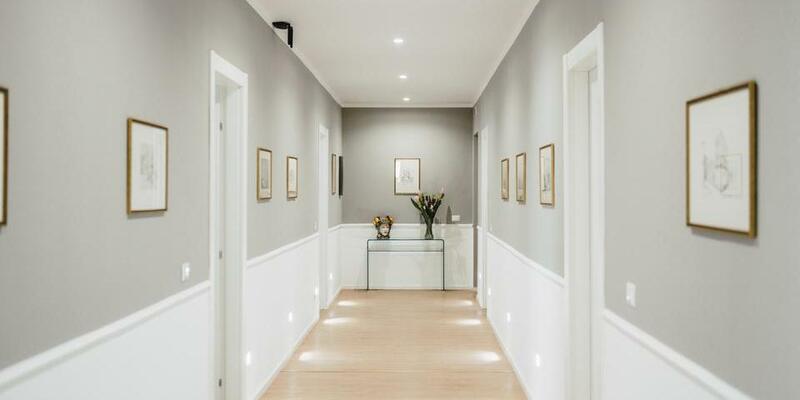 Moreover, the property is close to well-known attractions as Teatro Massimo and Via Maqueda.